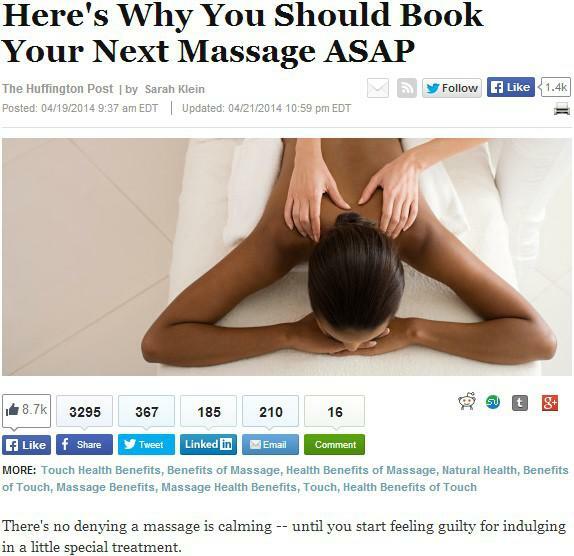 “There’s no denying a massage is calming — until you start feeling guilty for indulging in a little special treatment. A new study excuses us all from the guilt: Massage therapy isn’t just a way to relax, it’s also a way to alleviate muscle soreness after exercise and improve blood flow, according to the recent research. 1. Can help relieve chronic pain. A study published in the Annals of Internal Medicine in 2011 revealed that people experiencing chronic pain felt relief from symptoms after getting massages. 2. Helps boost immune system. Researchers at Cedars-Sinai Medical Center have reported that people who undergo massage experience measurable changes in their body’s immune and endocrine system. 3. Helps cancer patients deal with disease. Several scientific literature give credit to massage for improving the quality of cancer patients’ relaxation, sleep, and immune system responses. 4. Relieves depression. Doctors at I-Shou University in Taiwan found out that massage therapy significantly alleviates symptoms of depression. 5. Good for people with osteoarthritis. Yale University has published an extensive paper discussing how massages are safe and effective in reducing the pain experienced by adults with osteoarthritis and how it also improves their bodily functions. There are other researches that list the various forms of benefits people can derive from getting massage therapy. Let us not forget, though, to always check first if establishments that offer massage in Folsom, CA are equipped with trained and competent therapists, like The Healing Station is. Call us today for a massage, skin care treatment or pampering at 916-294-9980.